Trilliums grow wild in the forests in North America. The rhizomes are found just under the leaf litter surface so don’t plant them too deep. If planted shallow, the roots contract to drag the rhizome down to the optimum level. If planted too deep the rhizome cannot drag itself back up. Dried rhizomes will fail. The roots need to be live for successful growth so it is best to buy potted plants or rhizomes that have been freshly dug. Trilliums grow in forests under the canopy of deciduous trees so they must put on their show before the tree canopies are covered in leaf. 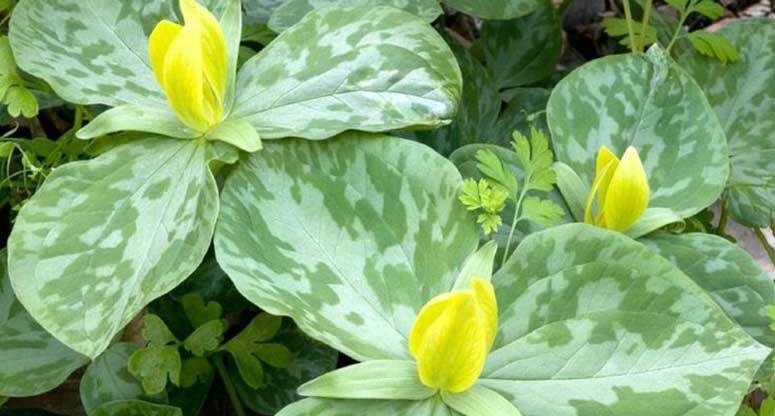 When siting Trilliums, grow them in cool light shade, not hot sunny positions. Plant them with plenty of garden compost or leaf mould. Do not plant more than 3-4cm deep. Protect emerging shoots from slugs. Trilliums like a good feed. Plant the rhizomes with some bone meal and fish blood and bone in the planting hole. Top dress with organic mulch every year. Keep plants watered well in their first year.